Figure 8.22. ICF propulsion system—mass budget (adapted from [Kammash, 1995]). improvements these remarks suggest one should be very cautious in assessing fusion technology. Inspection of the data in Figure 8.21 shows that MCF mass budgets are totally dominated, as many expect, by the space radiator. In the D-T-powered rocket the radiator mass is about 98% of the total mass. This effect is due to the figure of merit assumed in conventional radiator technology, of order 1 kg/KW to be dissipated into space, and assuming a maximum radiator temperature of order 600 K. In fact, NASA estimates that space radiators may be capable of between 0.015 and 0.2kg/ KW in its future nuclear electric propulsion systems. Remember also that in fission NTR no radiator is necessary: all the heat released by fission ends inside the pro-pellant. In thermal fusion rockets instead a large percentage of the power released is in the form of kinetic energy of neutrons and radiation, both not directly useable for thrust. This power eventually thermalizes within the reactor structure, and must be disposed of by a space radiator. The cooling issue is thus the major issue in current conceptual designs of MCF mirror rockets. From this viewpoint, ways to recover the radiation thermal load, for instance to produce electric power for an additional MPD rocket, may turn out to be indispensable to reduce space radiator mass and reach a reasonable mass budget. The resulting propulsion system would be hybrid, the thrust being partly direct thermal and partly fusion-electric. For ICF (see Figure 8.22) the story is different, because the contribution of bremsstrahlung radiation to the energy budget is relatively small, mostly because of pulsed mode operation. Accordingly, the estimated radiator mass is less than 10% of the total engine mass, compared with more than 98% for the two MCF concepts in Figure 8.20. Note that the electromagnet coil to protect the ICF rocket chamber, when added to the laser(s), makes up for 50% of the total mass. In Figure 8.22 the magnet coils are assumed to have been made of conventional electric conductors. Superconducting coils should reduce mass by at least one or two orders of magnitude. Therefore, the critical component of ICF rockets is the laser assembly needed to trigger fusion inside the pellets. In addition to their mass penalty, lasers absorb a good fraction of the fusion power, a second important penalty. ICF propulsion appears (in principle) to lead towards much more compact but less performing rocket propulsion systems compared to MCF rockets. The mass budget of ICF and its technical challenges are indeed formidable [Cassenti, 2004]. Figure 8.23. 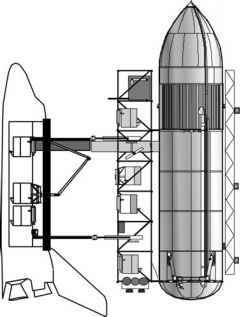 Schematic view of the VISTA ICF rocket-powered vehicle. rocket is fed extra inert hydrogen propellant to raise thrust. Most of the mass (4,100 tons) is in fact hydrogen propellant (D-T mass is only about 10% of hydrogen, or 40 tons). Total thrust power is 30 GW at a pellet repetition rate of 30 Hz. Estimated Isp is 17,000 s, rather low because of the inert hydrogen mass addition; see Figure 7.5. The VISTA concept has recently been revisited taking advantage of the so-called ''fast ignition'' pellet heating [Vchivkov et al., 2003; Nakashima et al., 2005]. The 50° cone nozzle keeps neutrons and X-rays from heating and penetrating deep into the spacecraft's structure. Much of the estimated performance depends on expansion of the plasma cloud that forms when the pellets are irradiated by the laser system, and on the magnetic field created by the coil located at the bottom of the spacecraft. For this purpose experiments were carried out and compared with CFD codes, resulting in a prediction of 60% conversion efficiency of fusion power to thrust power for the model tested in the laboratory. By reducing ignition energy the VISTA spacecraft may weigh only 1/7 of the original. Work on ''fast ignition'' heating is in progress in Japan and Russia. In fact, after looking at the main critical areas of fusion propulsion, what sort of performance may be generally expected? The answer is matter of (informed) speculation, because self-sustaining fusion per se has not yet been demonstrated experimentally. Based on the calculated energies of fusion products, practical Isp of order 105 to, perhaps, 106 s can be predicted with both D-T and D-He3 MCF rockets. An ICF rocket may be ideally capable of similar Isp during a single pulse, but a significant fraction of the pellet (its metal jacket) has higher molecular weight (e.g., Ti, 48, or W, 163) than He. Besides, an ICF rocket works in the pulsed mode (average Isp is lower than instantaneous). In fact, the ICF mass budget shown in Figure 8.21 was estimated by calculating an He exhaust speed 3.75 x 105m/s, and a tungsten (from the pellet jacket) exhaust velocity only 4.4 x 104m/s, consistent with its much higher molecular weight. The effective Isp is weighted toward the heavy tungsten ions speed, rather than towards that of the He nuclei. Comparison between thrust available with the two strategies depends on power assumed for a specific mission. Perhaps a better comparison is a comparison done per unit mass of engine. MCF reactors using D-He3 fuel yield about 2 x 10—2 N/kg, vs. about 0.7 x 10—2 for the more practical D-T combination, a factor two and a half higher. In both cases the thrust/mass ratio seems not too low, but the mass of the engine alone is astounding. Superconducting coils may help somewhat, but not decisively, in designing MCF propulsion systems. Current MCF rocket concepts should be revisited by including ways of exploiting the large neutron and photon energy fluxes that thermalize and must be rejected by massive space radiators. Information in [Brown, 1989] may be a possible starting point to this goal. Alternative, more compact concepts have been summarily proposed that may lower mass and size of MCF, see [Kammash, 1995, pp. 161 and 179]. These innovative concepts have been insufficiently analyzed to reach conclusion regarding performance, thrust and weight. Daedalus projects already mentioned. The Isp of Orion was empirically modeled as 4p = C0Ve, where C0 is a sort of collimation factor (<1) of the debris created by the nuclear explosion, and Ve is the debris velocity. For matched fireball and thrust plate diameters this factor is of order 0.5. The fireball diameter of a 1-megaton bomb is about 1 km, and the Ve may be of order 104 km/s: thus good matching would require extremely large thrust plates. In fact, a mid-sized Orion spacecraft designed at General Atomic [Nance, 1964] had a 40 m diameter and a mass 1,000 tons to 2,000 tons. To reach approximately 10% of the light speed required 1,080 bombs, each weighing between 370 kg and 750 kg. Thus a good guess for its Isp would be much less than 107 s, perhaps 105 s, given the size of the thrust plate. Daedalus was a 5-year study carried on by the British Interplanetary Society in the UK [Bond et al., 1978]. 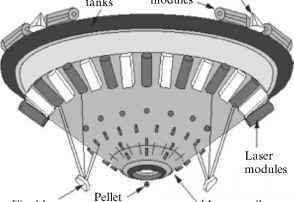 ICF was the propulsion technology, D +3 He the fuel, in the form of pellets. Since 3He does not exist on Earth, it was supposed to be collected in the Jovian atmosphere prior to starting the interstellar leg of the mission. Ignition was by electron beams. Plasma expansion to generate thrust was controlled by an electromagnetic nozzle, and that contributed to the astounding mass of the Daedalus ship (about 50,000 tons). Both projects lent themselves to criticism because of their technology, still immature today. Nevertheless, they focused on a topic (interstellar travel) at the time considered pure science fiction, and on a propulsion technology (sequential explosions) until then considered essentially destructive and thus unfeasible. In fact, interest in explosion propulsion is growing. Work in this area is still scarce and little known, partly because of its association with nuclear weapons (past work has been declassified only recently). Newer proposals are based on generating thrust via the Lorentz force rather than mechanically as in Orion. In essence, this means exploiting the electromagnetic pulse of explosions to induce a current driving Lorentz force pulses. MagOrion and MiniMagOrion [Lawrence, 2008; Ewig and Andrews, 2003] are recent examples; early suggestions are in [Winterberg, 1969; 1971]. On paper, these concepts yield Isp of order 104 s and higher; their main feature, however, is not Isp but thrust, in the range 105 to 106 N, enabling large acceleration and fast travel. The price is, of course, fuel consumption. Since explosions take place outside the spacecraft (as in the VISTA concept), unlike NEP no radiator is necessary. This said, the engineering of these concepts has not been sufficiently analyzed to draw substantive conclusions as to their merit. Work in fusion continues in the US (e.g., at the University of Michigan, Penn State, LASL) and in Russia (e.g., at the Ioffe Physical Technical Institute), but low funding and the many engineering problems to solve suggest no breakthrough is forthcoming anytime soon.